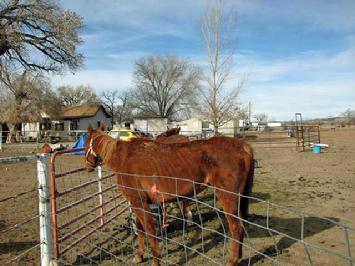 New Mexico Livestock Inspectors seized 4 horses and 5 llamas from a residence off the La Plata Hwy on Jan. 2, 2008. Working with Animal Control officers from the San Juan County Sheriff's Office and Four Corners Equine Rescue, all the animals were taken to Animal Haven Clinic in Farmington for evaluation and medical treatment. Of the horses, there is one 9 year old mare in very bad shape. Her body score is a 1, and her chances of survival are questionable. In the same pen with her was her 3 year old son, who is in better shape, and should make a full recovery. Remarkably, the mare did not test positive for pregnancy. 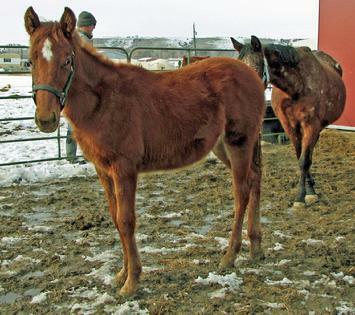 In another pen were the 30+ year old blind mare and her 6 month old foal. The mare is rated as a 2 on Henneke Body Score Chart, and should recover. However, the blindness appears to be permanent. She is using her foal as a seeing eye horse. The baby is also expected to make a full recovery, although she is pretty wild, and difficult to handle. The investigation continues. Sadly, one llama was dead at the residence. UPDATE - Ownership hearing postponed. Owner arrested on 10 felony counts of Extreme Animal Cruelty on 2-21-08. Sadly, two more llama have died. One had severe scarring from parasites, the second had 10 pounds of baling twine in her stomach and a piece of wire. The wire pierced the gut wall. Annie Sullivan pleaded guilty to 5 misdemeanor counts of Animal Cruelty in District Court. She was sentenced to 5 years of supervised probation during which time she was ordered not to own any animals -"not so much as a goldfish" according to Judge Birdsall. She was also ordered to pay restitution to FCER, the vet clinic, and the Aztec Shelter. FCER is currently in the paperwork process of getting the horses signed over to us. Cutie Pie will be returning from the trainers this week. She will be an excellent riding horse for a competent rider. She is spirited and energetic, and ready to meet any challenge you can but in front of her. Cutie Pie, Fiesty, Old Momma and Pretty Boy Floyd.